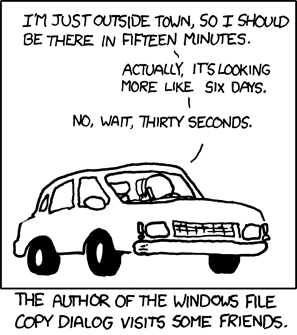 My other favorite time estimator is Stuffit, which back when I still used it would tell me that files would be completely unstuffed anywhere from -16,000 to 1,000,000,000 minutes. I never was sure how a file could have been unstuffed in negative minutes. Possibly Stuffit was trying to tell me that it had been unstuffed once before in the past, so why the hell was I opening it again?